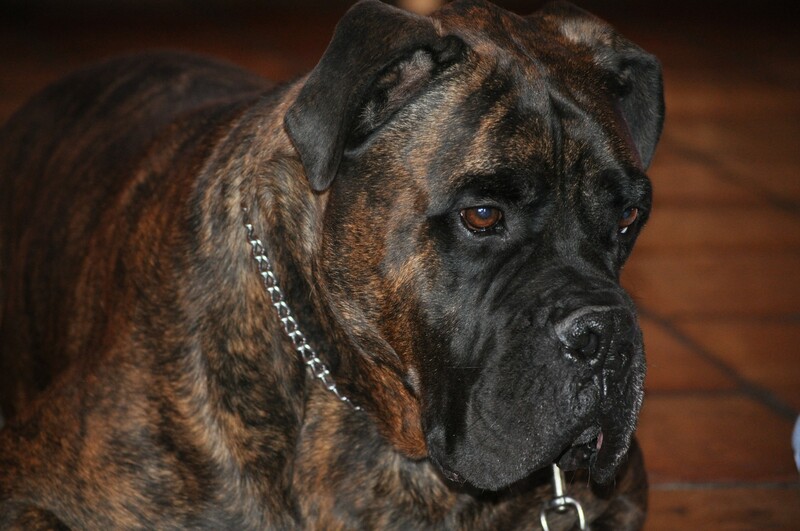 Trace is a purebred Bullmastiff - an English breed fashioned from the English Mastiff, and the English bulldog. Bred to current standard some years ago. Also called The Gamekeeper's Night Dog. Trace is around 125 pounds - all muscle! He lives in our friends Arlene and Rip in our neighborhood here in Tucson. He is one of Garrett's friends. The Bullmastiff is a large breed of domestic dog. It has a solid build and a short muzzle. The Bullmastiff shares the characteristics of Molosser dogs, and was originally developed by 19th-century gamekeepers in England to guard estates and immobilize poachers. The breed's bloodlines are drawn from the English Mastiff and Old English Bulldog. It was recognized as a purebred dog by the English Kennel Club in 1924. Males should be 25 to 27 inches tall (AKC Std) at the withers and 110 to 130 pounds. Females should be 24 to 26 inches at the withers, and 100 to 120 pounds. Bullmastiffs' coats appear in fawn, red, or brindle.